This tutorial guides you through deploying the Kubernetes dashboard to your Amazon EKS cluster, complete with CPU and memory metrics. It also helps you to create an Amazon EKS administrator service account that you can use to securely connect to the dashboard to view and control your cluster. You have created an Amazon EKS cluster by following the steps in Getting Started with Amazon EKS. The security groups for your control plane elastic network interfaces and worker nodes follow the recommended settings in Cluster Security Group Considerations. You are using a kubectl client that is configured to communicate with your Amazon EKS cluster. Use the following steps to deploy the Kubernetes dashboard, heapster, and the influxdb backend for CPU and memory metrics to your cluster. Although heapster is deprecated, it is currently the only supported metrics provider for the Kubernetes dashboard. For more information, see https://github.com/kubernetes/dashboard/issues/2986. By default, the Kubernetes dashboard user has limited permissions. In this section, you create an eks-admin service account and cluster role binding that you can use to securely connect to the dashboard with admin-level permissions. For more information, see Managing Service Accounts in the Kubernetes documentation. The example service account created with this procedure has full cluster-admin (superuser) privileges on the cluster. For more information, see Using RBAC Authorization in the Kubernetes documentation. Create a file called eks-admin-service-account.yaml with the text below. This manifest defines a service account and cluster role binding called eks-admin. 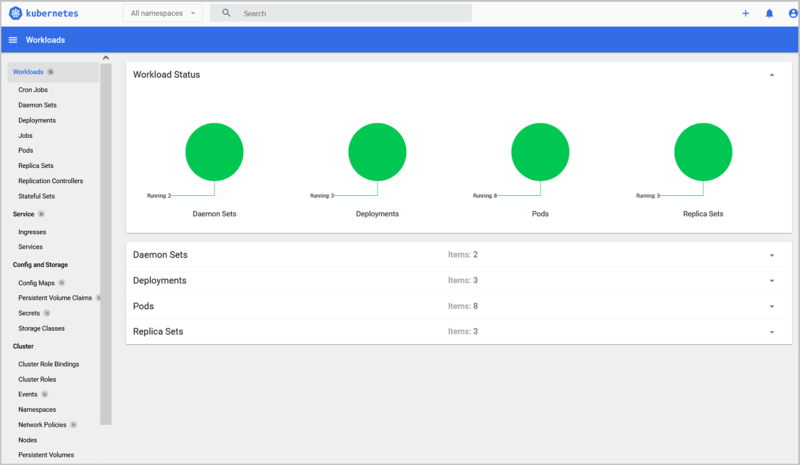 Now that the Kubernetes dashboard is deployed to your cluster, and you have an administrator service account that you can use to view and control your cluster, you can connect to the dashboard with that service account. Retrieve an authentication token for the eks-admin service account. Copy the <authentication_token> value from the output. You use this token to connect to the dashboard. Choose Token, paste the <authentication_token> output from the previous command into the Token field, and choose SIGN IN. It may take a few minutes before CPU and memory metrics appear in the dashboard. After you have connected to your Kubernetes cluster dashboard, you can view and control your cluster using your eks-admin service account. For more information about using the dashboard, see the project documentation on GitHub.